Given the pace at which technological advancements are transforming the world, there is no way the maritime and shipping industry can stay away from it. Some of the technologies that are sooner or later expected to come into play include artificial intelligence, industrial internet of things (IoT), autonomous surface vessels, blockchain, augmented reality, virtual reality, drones and robotics. The regional maritime industry has already started adopting a number of advances, particularly with computer-based technologies including automation, data, connectivity and analytics capabilities. DP World, for instance, has already begun implementing a new Global Digital System to improve its back-office functions across business operations and sectors in the global supply chain such as industrial parks, free zones and logistics, using cloud technologies. “We will also use Oracle software to create intelligent logistics through artificial intelligence, machine learning, IoT and blockchain,” says Sultan Ahmad Bin Sulayem, Group Chairman and CEO of DP World. He says DP World’s Smart Transport Initiative (STI) has helped improve the efficiency of Dubai’s supply chain through cost reductions, increased productivity and reduced carbon emissions. “STI has also reduced truck entry and exit turnaround times at Jebel Ali Port by 40 per cent, while improving gate capacity from 500 trucks per hour to a remarkable 1,200 trucks per hour,” he adds. Digitisation and new technologies like blockchain are rapidly changing all industries, forcing businesses to prepare for a tomorrow that is unpredictable, says Christopher Cook, Managing Director, A.P. Moller — Maersk, UAE, Oman and Qatar. At the end of 2018, his company announced the launch of Twill, an innovative digital freight forwarder in the UAE that allows customers to book their shipment from a number of export countries, such as China, India, Vietnam and Indonesia, for import of goods into the emirate. “Twill is designed to enable small and medium enterprises to access instant online quotations and bookings on their preferred trade lanes at the click of a button as well as greater transparency in tracking cargo throughout the process,” he says. Maersk’s new shipping digitisation platform, TradeLens, which the company developed and launched in collaboration with IBM last year, helps get rid of “the siloed process for trade documentation and data sharing” that creates delays and uncertainties in the global supply chain. “The platform has the potential for significant savings for all parties in the global supply chain — shippers, 3PLs, carriers, terminals and more, which also ties in closely with Dubai’s agenda of going paperless by 2020,” says Cook. Topaz Energy and Marine, another leading international offshore marine logistics and support vessel company headquartered in Dubai, has recently implemented the use of IoT to transmit real-time data on 20 vessels. “This data is analysed to boost vessel performance in a variety of ways, ranging from better use of fuel to better use of downtime,” says Kris Vedat, Head of IT, Topaz Energy and Marine. Topaz, which provides logistics support and marine solutions to the global energy industry with a primary focus on the Caspian Sea, the Middle East, West Africa and global subsea operations, has managed to move to a condition-based maintenance model, thanks to having IoT on board. “Predictive maintenance has helped us increase the availability of individual vessels by organising their downtime, thereby yielding the cumulative effect of improving overall fleet and fuel efficiency,” he says. Given that there is so much emphasis on improving operational efficiency using technology, IT solution providers are constantly interacting and working with ship-owners to offer what suits them the best. ShipNet, an integrated maritime ERP platform provider with an operating office in Dubai, says it has invested in developing new solutions on a .Net platform (some of them include cloud-based, mobile-based or automation solutions) that give customers the ability to better manage their cash efficiencies as well as operational efficiencies. “This is a significant differentiator compared to other point based solution providers in the marketplace as not only does a customer get all the basics required to operate in one solution but [they] also get constant innovation that support the evolution of their business model with a clear focus on the right parameters for the business,” explains Suren Thadani, CEO of ShipNet. The additional area that the company has focused on is integration of their platform with a number of solution providers that offer specialist solutions for customers in this sector. Most offshore support vessels operators in the region are still in the initial stages of their digital journey, but Vedat says there are some who have the equipment and systems in place that are beginning to reap the rewards of having access to real-time data. “The next stage of the journey will be to improve the quality and accuracy of the data and on identifying patterns and applying this knowledge intelligently across the business,” he says. Bin Sulayem points out that new technologies take time to implement and even longer to have a truly global impact. “We recognise the value of joined up thinking and long term partnerships — connecting multimodal transport, industrial parks, economic zones, ports and terminals through a focus on infrastructure, which is also why we invest in disruptive new technologies such as Hyperloop, resulting in freight at the speed of flight and closer to the cost of trucking,” he says. 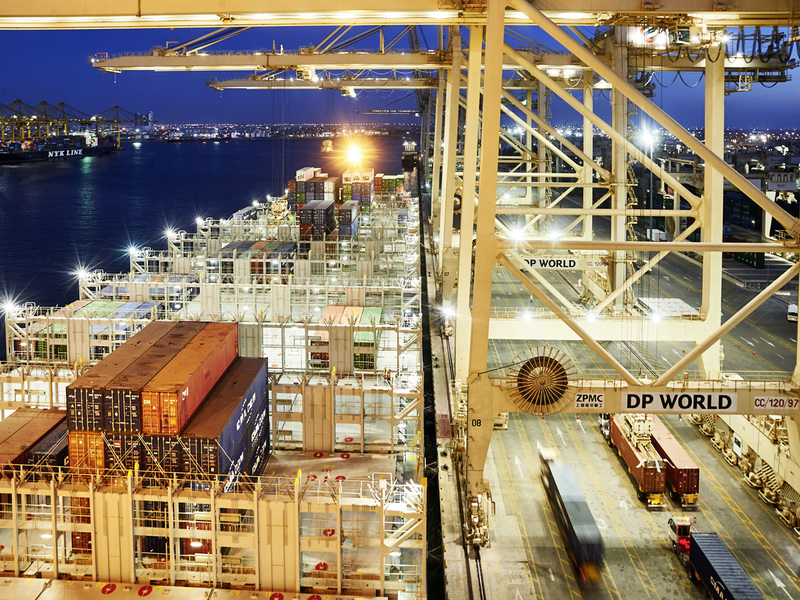 DP World is also working on the world’s first high bay container storing system to be ready for Expo 2020 Dubai. The system will allow containers to be stored in an 11-storey rack, creating 200 per cent more capacity than a conventional container terminal. A.P Moller — Maersk, which claims to have reduced its relative carbon emissions by 46 per cent (baseline 2007), around 9 per cent more than the industry average, aims to have carbon-neutral vessels commercially viable by 2030. “Over the next five to ten years, Maersk will invest significant resources for innovation and fleet technology to improve the technical and financial viability of decarbonised solutions,” says Cook.